Venezuela's chaotic economy is crushing the company that makes America's best-selling cookies. 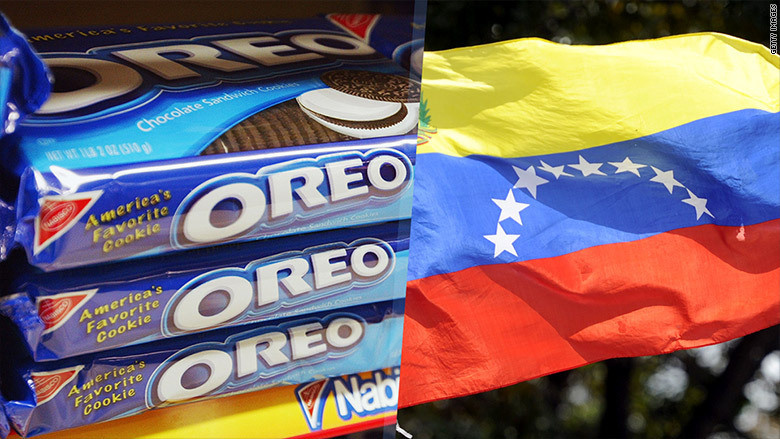 Oreo-maker Mondelez reported a $778 million loss on Wednesday from its business in Venezuela. The business climate there is so chaotic that Mondelez said it will continue to sell oreos and other products in Venezuela but has written off that business. In other words, it won't count any of Venezuela sales in its results going forward. Mondelez (MDLZ) isn't alone. In October, Pepsi (PEP) reported a $1.4 billion loss in Venezuela and also wrote off its business there, even though it plans to continue selling its drinks and snacks in the country. What's driving this extreme step from big name businesses is Venezuela's hyperinflation, political infighting and tanking economy. The International Monetary Fund projects inflation in Venezuela this year will rise 720% after climbing 275% last year. Its currency, the bolivar, has crumbled in value -- today, one dollar fetches 1,003 bolivars, up from 183 bolivars a year ago, according to dolartoday.com, a website that tracks the unofficial exchange rate. Mondelez said in a statement: "Given the current and ongoing difficult economic, regulatory and business environment...there continues to be significant uncertainty related to the company's operations in Venezuela." It's not just snacks and sodas either. Ford (F), Citigroup (C), Oracle (ORCL), IBM (IBM) and American Airlines (AAL) have all noted the tough business climate and their exposure to Venezuela's currency collapse in the past year. Venezuela's economy shrank 10% last year and will remain in recession until 2019, the IMF projects. Meanwhile, Venezuela's president, Nicolas Maduro, is fighting against an opposition-led Congress which recently took office and wants to impeach him. He packed the Supreme Court with his supporters to prevent legislation from passing, such as freeing political prisoners who criticized him. It's this chaos that American companies are trying to walk away from.